I'm not ready to go out a just fork out the money for a new sewing machine yet. But I know the day is coming when it will be time to toss the old one out the window... er, I mean, replace my current machine. I've been peeking around a bit online and of course every site says their machines wonderful. I am having a hard time getting some real and honest reviews. They can't all be winners, ya know? I favor reliability over bells and whistles - don't need a lot of fancy features. My problem with my current machine (a Singer) has always been the tension setting and I would LOVE something that caused me a little less grief in that regard. So, I'm asking - does anyone have advice on good reliable brands OR brands/machine to avoid? Let it all out, folks, I'm listening. I love viking, I've had it about 10 years. I have a total workhorse named Ken...he's an old Kenmore; trusty and reliable, probably cost $129 at Sears. I strongly recommend finding a sewing center that carries multiple brands that will let you test drive various machines. That is how I settled on the Babylock. I had a very basic Singer when I first started then my mom surprised me and bought me a heavy duty Singer. I love it. I'm a pretty simple, still learning sewer and it works great for me. My previous Singer had some serious issues, but this one is great. Not a single problem. Even though I didn't pay for it, I believe it is worth every penny. Well, I have two machines: a Bernina 180 and a Pfaff 7550. 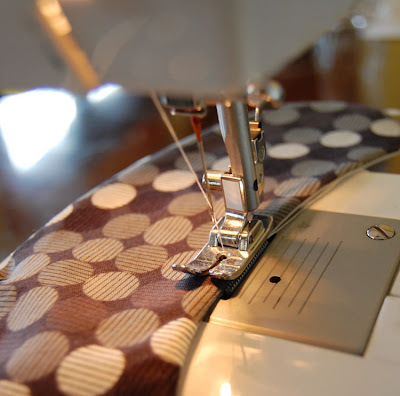 The Bernina has an absolutely beautiful sewing and quilting stitch. I wouldn't trade it for the world. Would I buy it again? No. Bernina is a fantastic brand that I would highly recommend but I think I bought more than I needed. My Pfaff 7550 is my workhorse machine. Its fast and it works beautifully. I agree with the suggestion to go in and test drive a few models. I thin if I ever buy another machine I would buy an industrial one. My must have features include an ability to drop the feed dogs, a high throat (because I quilt); needle down feature, reverse ability and SPEED. Last thing, it seems like every year Threads Magazine does a special section on sewing machines. I think it's worth looking at their site to compare ranges and prices before you begin your search. Good luck! So, I had a crap Singer for years, and it made me think I couldn't sew. The tension was pure madness, absolutely never right. Then I got the Jenome Magnolia--a very basic (and, I think, inexpensive) machine. I have never had a single problem with tension. I love it. I sewed on a very basic Brother for years and years. I always had issues but didn't really know that one needn't have those issues such as tension. About 8 years ago, I test drove a used Bernina from an authorized retailer. People trade them in for fancier models. Well, my gosh, i never realized what I was missing till I sewed on the Bernina. The control of the stitching was just amazing...I can sew one stitch at a time if I want. Being able to do hands free foot lifting is also a huge plus so for me....a used Bernina is the way to go! I have a Bernina and I love it...but you know what, that doesn't matter. TEST DRIVE them all! If the store where you go to purchase yours won't allow you to try it out, then move on to the next store. How will you know if you'll like, if you can't test drive it? Good Luck! It's so hard to know which will be best! My mother just handed down to me her old Bernina, as she got a whoppingly awesome new one. She went with Bernina simply because there is a dealer near us. She was able to try out machines in person and they can do repairs and have classes. I was using a very, very basic Singer, and one thing I really appreciate about the Bernina is that is has a way to control the speed. I often felt on the singer that I was trying to ride an out of control horse. I'm feeling encouraged here now. Sewing without the constant fiddling with the tension setting sounds so fabulous. My local Hancock fabrics sells some the brands recommended (Janome and Bernina) so maybe I'll go and see if I can try one out. Thanks everyone! I went through 2 singer's, and was almost ready to give up due to the tension issues. Then, I got a Janome Thread Banger, and LOVE IT! It is pretty basic in terms of stitch functions, etc .... but I do not have any tension issues with it, and it makes sewing enjoyable instead of frustrating. I do find that my machine "likes" gutermann thread better than coats and clark though, so I guess that is one peculiarity, but I LOVE IT! When I went shopping, I didn't think I would be getting a machine with so many features. I was looking for a workhorse that was simple. Here are the things I now find I LOVE about my machine. I highly recommend going to the little sewing and vacuum shops. You'll learn a lot, and you may be able to find a used one. I got mine a year old for about 1/3 of the price it would have been new. The precision of stitching instantly made my garments and projects look so much better. Can't wait to see what you end up with! Well, gee whiz, now I'm almost sorry I asked because I am sooooo excited about buying a new machine right now even though I have to wait just a bit longer before I can. Oh well, I will have fun doing my research and when the time comes, I will know exactly what to get. Thanks everybody!! get a Janome! Or a Kenmore that Janome makes. Stay away from Brother or Singer. after a number of frustrating sewing sessions, i've also been looking around at new machines. the janomes sound like great machines, though i think i'm leaning toward a juki, specifically the tl-98q. it gets so many great reviews and i think it would be amazing to quilt on. good luck with your search! I have a mint green Hello Kitty machine from Janome! I purchased this one because it got good reviews and the small size works well with my small space. I actually do love it! I would probably not recommend this to anyone who isn't a beginner or adv. beginner. You can't adjust stitch length, there are only a few pre-determined stitches, etc. And it's SLOW, which I actually need because I think my lines look like I'm sewing under the influence. BUT, it's a great machine for someone new, or as a super-portable machine. Janome has extra feet you can stick on it, so you can actually do free-hand embroidery, use a walking foot for applique, a ruffler, etc. (You can only do this with the mint green model, apparently.) Someday I will also upgrade to something snazzy, but I'll still keep this little one too! I'm going to chime in and say Janome or Kenmore as well. I have a Janome 6019QC (Quilter's Companion; I don't quilt, but it's a great sturdy machine with a lot of features) and love it. Hey! Just to say I have a 95 Singer that I LOVE SO MUCH but it wouldn't do free motion quilting. So I tried upgrading to a new Singer and it was really, really low quality. I returned it 3 days later. I did a bunch of research and fell in love with Pfaff 2124. I got mine on Ebay for $700 - it's an older machine but MSRP was like $2000. It has an embroidery arm which I never use so, oh well. I think if I went back I would go for more decorative stitches and lose the embroidery capability, but this machine is great. The big deals are on ebay but the caveat is you don't get the help from your local store when getting started. I muddled through.